thadAdhE ozhiyumO thAy?- a mother (similar to emperumAn) would only push the child away from the fire, wouldn’t she? 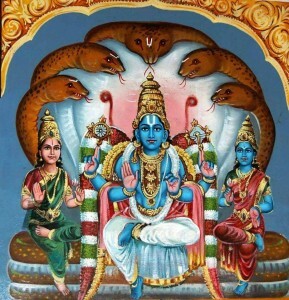 Synopsis: In this pAsuram, svAmi aruLALa perumAL emberumAnAr illustrates a fact with an example. He says that sriman nArAyaNan would not give all the things that HIS devotees ask for. HE would never give those things to HIS devotees who does not know then that it would be harmful for them. They would develop desire on those things and think that it is good. However, sriman nArAyaNan, who knows the real impact of those things to HIS devotees, would not give those things to them. This fact is supported with an example in this pAsuram. viruppuRinum: The devotees of sriman nArAyaNan, desire to have a few things in life that are regarded as silly / trivial. They ask perumAL those things with a lot of effort, knowing that if HE does not give those, then it would be very painful for them. The word “viruppuRinum” describes the maximum extent to which HIS devotees might go in pleading HIM. vENdum idham allAl: “idham” is the thamizh equivalent of the sanskrit word “hitham”. This means all that is necessary for the devotees mentioned above. The likes of devotees can be classified into two types namely all that they like and all that are necessary. “idham” refers to the latter. Hence the phrase “vENdum idham allAl” would refer to all those that is not necessary for their good living. “allAl” is a negation and hence it would point to all those that is not needed for the better living of devotees. thiruppolindha mArban: This refers to the One who has a resplendent and shining chest because periya pirAtti sits there. HIS chest gets the brightness / shine because of association with pirAtti. AzhvArs say “karumANikka kundRathu thAmarai pOl thirumArbu, kAl, kan, kai, chevAi undhiyAne” and “karumANikka malai mEl, maNi thadanthAmarai kAdugal pOl, thirumArbu vAi kaN kai undhi kAl udayAdaigal seyyapirAn”. In these pAsurams, it can be seen that like other parts of perumAL’s body, HIS chest is also bright and shiny. It is good to note that HIS chest (thirumArbu) was mentioned first in that list. svAmi nammAzhvAr says “alar mEl mangai uRayum mArbu” , i.e., since periya pirAtti seats on HIS chest, her divine resplendence is spread throughout HIS chest and so it looks beautiful and shining. In this pAsuram, HIS chest is being described as one that gets the source of its brightness from pirAtti’s association. Hence, “thiruvAl polindha mArban” describes HIS chest’s beauty. It also describes the association of pirAtti. Hence, the underlying fact that is being implied here is that they both (perumAl and pirAtti) are together always and so they would be ready to bless their devotees always. aruL seyyAn: The devotees how much ever they plead certain things to HIM, HE will not give those things to them. The reason is that HE knows that these things will not do any good to them. However, the devotees because of their limited capabilities does not the long term impacts of those and would ask certain things that they think is good for them. It is perumAL who because of HIS truly wishful thinking that HE rejects their requests at that time and consequentially denies them the things that they asked for. neruppai vidAdhE kuzhavi vizha varundhinAlum thadAdhE ozhiyumO thAy? : There is a child that is playing. It sees a fire at some distance and is amazed by the fire’s super shine and effulgence. It does not know that the fire would hurt its body. However, attracted by the fire’s brightness, it goes towards it and wants to have it in his hands and play with it. The child’s mother is nearby and is keeping a watchful eye at the child. Will the mother allow the child to go near the fire and play with it, even though the child makes steps to go near the fire? She would certainly prevent the child from going to the fire. Similarly, perumAL who knows the real impact of everything would not yield something that HIS devotees ask HIM without knowing the ramifications of their request. How much ever they plead and turn upside down, the answer from HIM would be an strong “no”.